These are all good things! Yesterday, Keith asked me if I wanted to go out to breakfast on Sunday morning, and I said, "NO! I'm going to make breakfast!" If you know me, you would know that I absolutely never under any circumstances - EVER - turn down a trip to go out to breakfast. That's how obsessed with my kitchen (and cooking in it) I am. Onto the recipe. I was trying to figure out what to make for breakfast, and my brain was foggy. My brain usually is foggy on Sunday mornings. I think it might have something to do with the little bit of a lot of wine I tend to drink on Saturdays. Oops. OK, this is easy peasy. Boil the potatoes for about 10 minutes, until they are soft. While those boil away, cook the turkey bacon according to the package directions (throw them in a pan and cook at medium heat about 3 minutes per side, until crispy). Set aside on a papertowel-lined plate to cool. Drain the potatoes and set aside to cool slightly. Crack the eggs into a bowl, add the milk, and whisk until blended. Then, quarter the potatoes into small bite-sized pieces. Add the oil to a deep frying pan and turn on medium high heat. Add the onions, green peppers and potatoes. Season with the salt, pepper and chili powder, and let cook undisturbed for a good 10 minutes. Scramble the eggs for one minute over medium heat in the pan you used for the bacon. Then, add the jalapeno and green onions and finish cooking until just set. Remove from heat. Flip the potato & veggie mixture, they should be browning nicely but not burnt! If they are getting too brown, turn down the heat. Slice the bacon into bite-sized pieces. Try to resist eating it. Add the bacon to the eggs and mix together. Warm the tortillas according to the package directions. Place each on a plate, and add a sprinkle of cheese. Then add about 2 tablespoons of the egg mixture, and 2 tablespoons of the potatoes & veggies. Serve open-faced with the srircha and sour cream on the side! Seriously, SO good! Perfect after a night of drinking a bit too much wine for a Sunday brunch at home! Well color me embarrassed. It's been like oh, about EIGHT MONTHS since I last updated! YIKES! Maybe that's where I went wrong. New Year's was over a month ago! Anyways, there's been a lot going on. I do have some killer recipes to post and I will be getting those up soon. Thanks for not giving up on me, and keep an eye out for some new posts! We are finally getting settled into our new house! I will post pictures and such soon. Tuesday was the first time I've used my new kitchen, and I just have to say, I love it! Tons of counter space, bright, and clean. 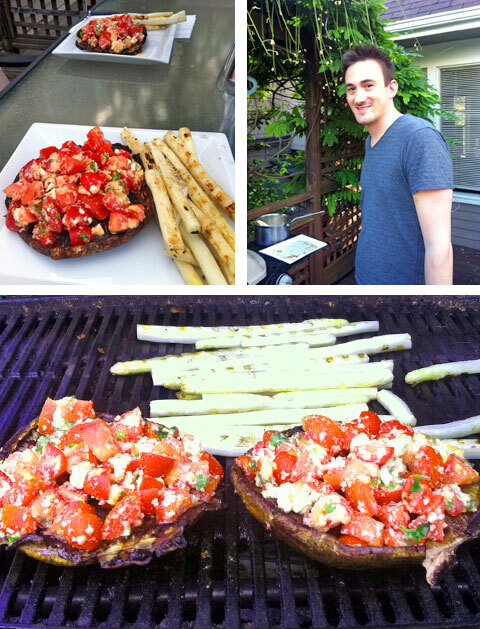 Our friend Nick stopped by after work to grill up some burgers (on our grill inherited from him, YAY! ), so I decided to whip together some sides. This was voted the best potato salad ever on Chow.com, so I had to give it a try. I pretty much stuck to the recipe, but I modified the instructions below to be more helpful. Definitely use a large skillet to cook the onion as you'll need the room! 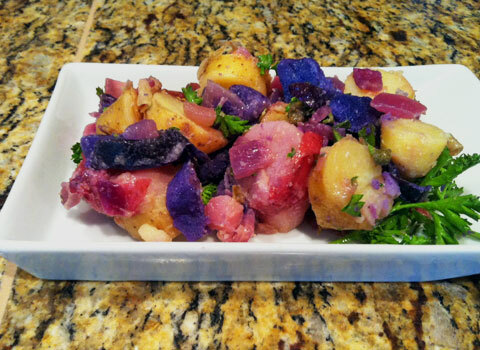 Also, I used colorful fingerling potatoes, which gave this salad a totally unique look! Steam the potatoes for 15 minutes or so, when you can pierce them easily with a fork. Be careful not to overcook them, or your potato salad will end up a bit mushy. Heat the olive oil in a large non-stick skillet over medium heat. Add the red onion and sautee for about 10 minutes, until onions are softened but not browned. Turn off the heat and add the vinegar, capers, mustard, pepper, and salt. Set aside. While they are still hot, slice the potatoes into bite-sized pieces, then add them, the parsley and the chives to the skillet. Mix until everything is coated. Great recipe, and very different from the traditional mayo-covered onion and egg variety (although I love that kind too at times!) The tastes are complex and rich, the capers provide a lovely distraction from the carmelized onions. Great to bring to a BBQ, since this recipe is gluten-free and vegan. I highly recommend this! I found this recipe on my new favorite food blog, OperaGirl Cooks, and aside from being gluten-free and vegan, it's flavor is out of this world! Even better, this is such a versatile dish! I made it as a side dish a couple days ago, and then decided to top a giant spinach salad with it for lunch (along with some sliced cucumbers, cherry tomatoes, and turkey). My mind is racing with all the potential - serve with brown rice as a vegetarian main course, add to a stir fry with noodles, top with chicken, etc. I do have to warn you - I used two large jalapenos, seeded, and it was pretty spicy. If you don't like spicy, I would use one small jalapeno and make sure to scrape all the seeds and the white membrane out. You definitely want a little bit of heat to balance the ginger and the sweetness of the veggies! Combine all the vinagrette ingredients in a large mixing bowl. Whisk well and put aside. Bring about 2 inches of water to boiling in a large pot with steamer. Add the carrots and let steam for about 3 minutes, then add the snap peas to and steam for another three minutes or so. Directly from the stove, dump the veggies into the mixing bowl with the dressing. Mix well, cover, and let sit for at least 20 minutes. This can be eaten warm, room temperature, or cold (and it's delicious all three ways!). How could anyone be unhappy whilst wearing these shoes?! They just assert, "I am happy and cute!" I have been eating like crap lately. And by "lately," I mean for the past 3 weeks. And by "like crap," I mean TERRIBLE! Cheeseburgers, quesadillas, fries, cake, candy, everything that I always say to avoid. I attribute this to the fact that a) we haven't gone grocery shopping in oh, three weeks; b) I've been traveling (once for work to L.A. and again for a weekend getaway with the sweetie); and c) I haven't been working out. The other day I wanted, nay, I needed to eat something healthy. I have very limited items with which to concoct said dish, but I managed to pull together a half-way decent salad, which I will now share with ya'll. Cook the rice, leafy greens and edamame according to package directions. Drain the edamame and let cool in the strainer; set aside. In a large bowl, mix all ingredients except the feta & edamame until well combined. Shell edamame and add the beans to the salad. Mix well, add salt & pepper to taste. Sprinkle feta on top, and either chill or serve warm. This tastes great cold, so you can eat it warm for lunch and then serve cold with a main course for another meal, if you like! I think the days that are supposed to be cruddy but end up being absolutely gorgeous are my favorites. Easter Brunch; or, Why the heck didn't you take any freakin' pictures?! And of course, I got exactly zero pictures of it! BOO! But the recipes all came out pretty good, so I'm posting them without pictures. Keith & I dyed Easter eggs the night before and we did an Easter egg hunt (guys vs. girls, of course! ), which was fun. Nick & Rachel brought mimosas made with cranberry-vanilla mix and cava. We had a really nice day! I kicked these up a notch by using a mix of Dijon and wasabi mustard, plus peppered thick-cut bacon. They are addictive so watch out! Slice each egg in half length-wise and seperate the whites from the yolks. Mash the yolks with all the ingredients above except the bacon until creamy. Using a spoon, fill each egg white with the mixture until heaping. Garnish with the bacon and enjoy! These can be made the night before and refrigerated.